“Very different sound“, says Fiadh. And he is, of course, right. This band, Niteworks, from the Isle of Skye, is truly exceptional. And their song, Air Fàir an Là, is only brilliant. No. 4 on the 2018 Christmas CD for Pádraig. It was also great to be reminded of this year’s Féile na Gealaí festival in Rath Chairn that Pádraig went to for an afternoon. Looking forward to going back in 2019! And maybe for longer than just a few hours! Please keep the songs coming!!! Here is something quite groundbreaking. Another First. You’ll remember that we discovered recently that Pádraig has no problem reading by showing him the first half of a sentence and giving him four options to finish it, with just one option being right (and me wondering why it was us coming up with the idea, instead of a ‘professional’…). 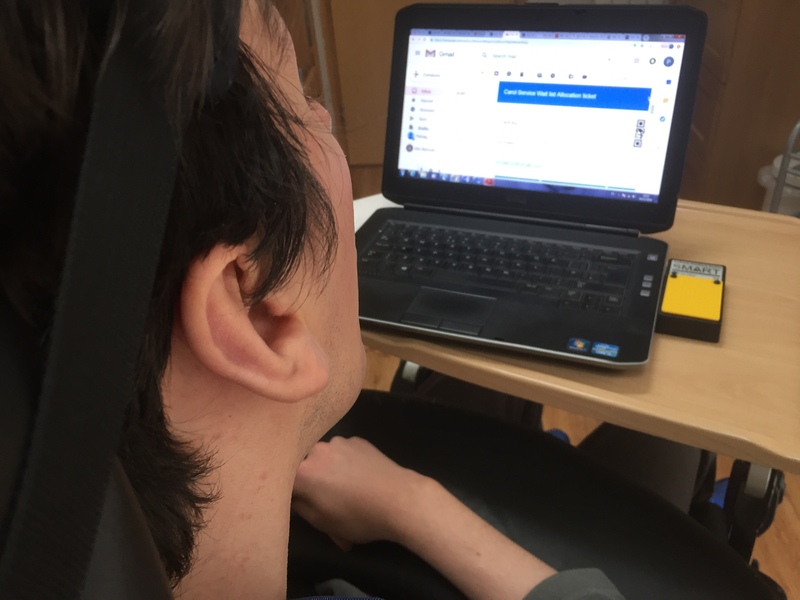 Over the last couple of days, we took it a step further and got Pádraig to check his email. Ok, he is a bit behind and hasn’t really caught up with his mails. Like five years behind. But, he has a good excuse, right? So he started to get in touch with his old ‘alma mater’ and their alumni association to see whether they could get him a ticket to their Christmas carols tomorrow. Of course, they could and they were extremely kind and helpful about it too. Makes sense to start using email again. Typing is very slow and requires a lot of help. There are no miracles. So there won’t be any independent long email-writing for some time to come, I’d say, but so what? Let’s keep this short and to the point for a while until he’ll get used to it again. Today we went to the second last student lunch time concert in St Patrick’s College Drumcondra. It was fantastic with an incredible mix of music from medieval dances to CSNY and Abba. My favourite song was Grow Old with Me by Tom Odell, a song I had never heard before by a singer whose name I didn’t know (unlike the nearly 26m viewers of the video on youtube). The version by the students was better though… as it happens he is exactly Pádraig’s age. Thank you very much, Sadhbh! Talking Heads, Steely Dan and Cairnhorm are excellent suggestions!